The adidas shoes is updated for the fall/winter season with the addition of Gore-Tex added to its upper. Colored in classic white/black hues across the Primeknit upper, a Gore-Tex layer is added for weather-resistance. Black boosting cushioning, matching EVA inserts on the midsole, branded heel pull tabs and Gore-Tex branding throughout complete the design altogether. Releasing later on this month, here’s a good look at the two pairs that make up the adidas shoes sale.adidas upgrades the lightweight and breathable model by making it more suitable for the cold winter season. The do this by having the shoe’s upper constructed out of a Gore-Tex material that will help keep you dry and warm. The adidas NMD CS1 Gore-Tex Pack comes in your choice of Black and White or White and Black. The tonal Primeknit uppers are offset by contrasting Boost midsoles and EVA inserts. Already looking toward the colder months, adidas Originals adds rugged detailing to the adidas nmd and Seeulater silhouettes for the “Winter Wool” pack. Both shoes in the pack are treated to a material upgrade via wool Primeknit construction, with the familiar NMD_CS1 silhouette boasting reflective tape overlays, while the trail-oriented Seeulater (which you also may have spotted during adidas’s Pitti Uomo presentation alongside White Mountaineering) retains its hulking blueprint and aggressive tread alongside a Primeknit collar. The pack maintains winter appeal through monochromatic colorways, allowing thoughtful details and materials to come to the forefront. 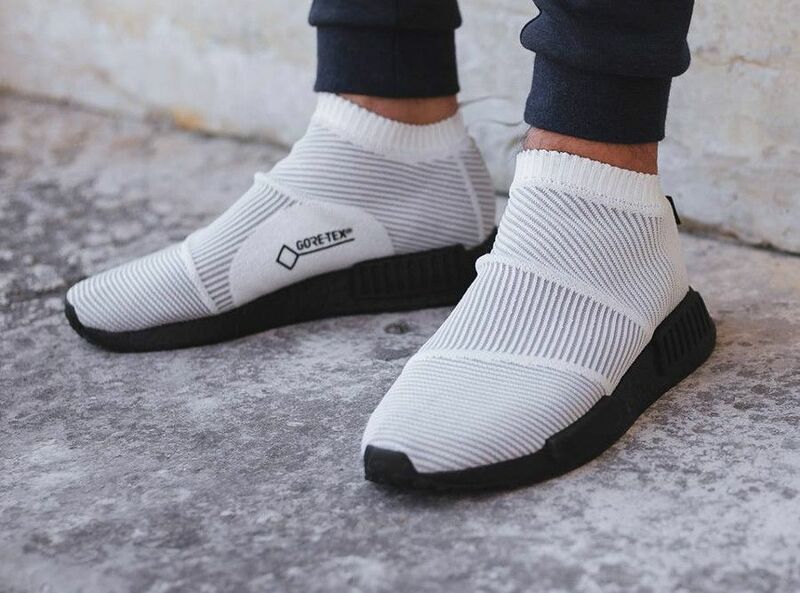 Following a recent first look at its tonal black/white iteration, the new adidas nmd cs1 gore-tex white is unveiled in another variation this season. Essentially a mid-cut rendition of the newly-introduced silhouette, the model dubbed, NMD_CS1, is inspired by contemporary functional designs and high-fashion sensibilities. Compared to its traditional build, this pair utilizes a sock-fit Primeknit textile upper in a clean striped motif in timeless shades of black and white. All resting atop a full-length Boost midsole unit with referential EVA inserts in its respective colorway.